Hello other users of this site; I am hoping you can help me. I am writing from New Zealand. I have a Jensen Interceptor that I have been restoring from the ground up for the past 10 years. I have almost finished and am researching the cars history. My car is a 1972 Jensen Interceptor III, it was primrose (yellow) in colour with a black vinyl roof and was first sold by Endcliffe Motors in Sheffield probably at the end of 1972. It was sold to Eversure Textiles Ltd and I have tracked the owner, David Wosskow, and spoken to him last week. David owned the car for about 15-18 months. He gave the car back to Endcliffe Motors when the cars engine bay caught fire in Sheffields main street one day. David said it was quite a sight. He said that Endcliffe Motors took the car back and he thought they sent it back to the Jensen factory for repairs. He said he was given a loan FF Interceptor to run around in whilst they sorted it out. He never saw his car again and went on to buy another type of car. I was hoping to locate employees of Endcliffe Motors about this time, 1973,74,75 who may remember this incident and may know of the fate of my car. I came across a 'DaveH' who is regular user of this site that said he had worked at Endcliffe Motors at one point. I am picking the car may have come back to Endcliffe Motors for re-sale once repaired. Any help would be appreciated. For your interest, at some stage the car made its way to Hong Kong. I think around 1980. It was purchased by a New Zealander in a poor state in the late 80's. He had the body restored but everything stripped out of the car and in boxes. This is how it was shipped back to Auckland New Zealand and then sat in a garage for some 20 years before I came across it. The car has had the works and is almost ready for compliance and registration. Knowing the cars history helps that final process. What a fascinating post. I hope you get some answers. Quoting the car's registration number may jog someone's memory. For no apparent reason, people tend to remember that sort of thing. I still recall that my Dad's first two Hillman Minxes were KAL 554 and 772 WB, and that's well over 50 years ago. Here's a photo from picturesheffield.com. 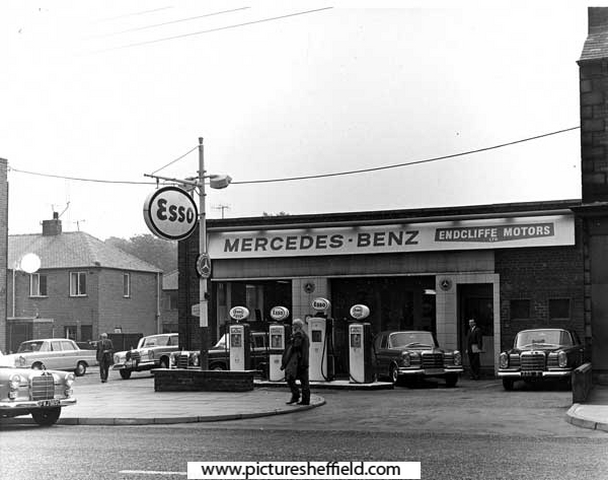 Endcliffe Motors, 495 Ecclesall Road, taken on 3rd August 1965. Though no Jensens in sight. 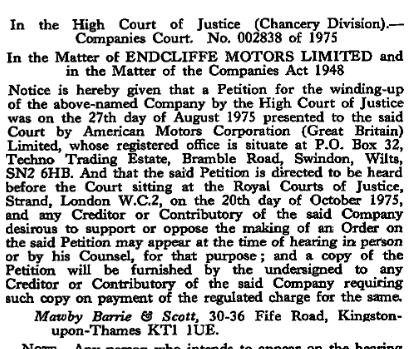 Maybe as the Endcliffe Motors that were the Jensen dealers, were on Bramall Lane? Funny that, as I always thought the Old Albion Brewery was 69-71 Ecclesall Road? So, not Bramall Lane, but neither 495 Ecclesall Road? Or is it? 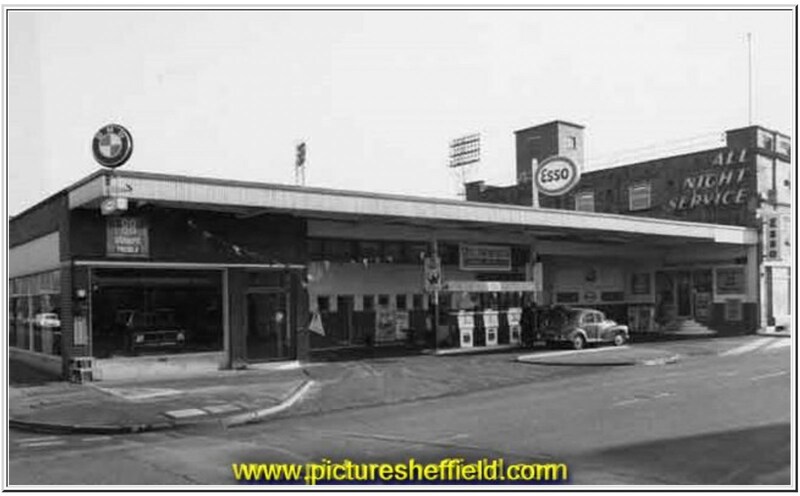 Endcliffe Motors in 1975 were on the corner of Bramall Lane and John Street. The old brewery premises they occupied was the Britannia Brewery, not the Old Albion (Wards). 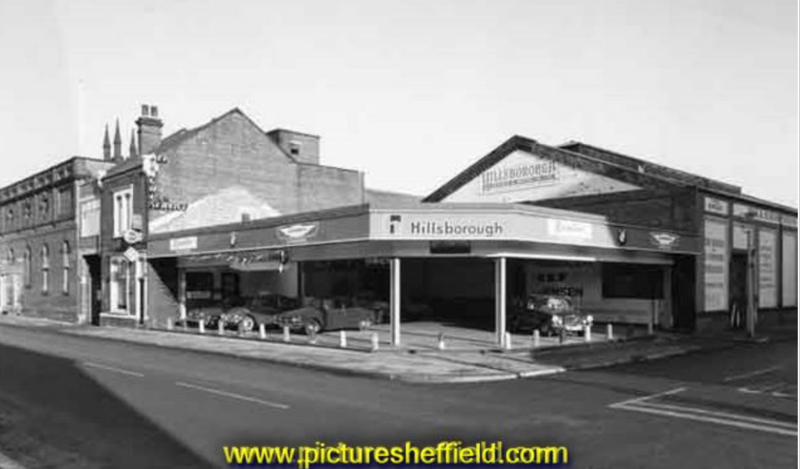 In 1972 the premises were the Hillsborough Garage and Motor Company. The old Hillsborough Garage premises next to the Barracks on Langsett Road were sitting empty in 1972. Here's a photo of the Hillsborough Garage and Motor Company on Bramall Lane in 1972 - they were a Jensen agent according to their signage. Might the brewery have been the Anchor Brewery on the corner of Cherry Street? There are actually two photos on Picture Sheffield of “Hillsborough Garage and Motor Co Ltd, Bramall Lane”, both dated 1972. 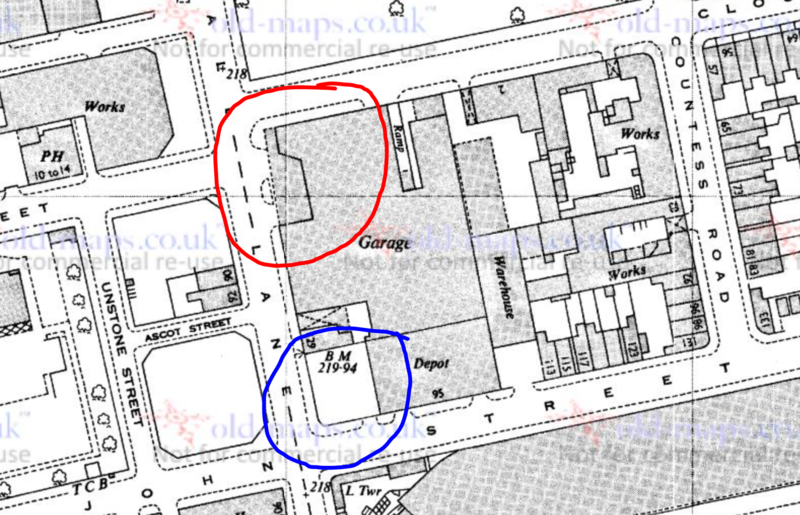 From a map of that date, it appears to me that these two garages both existed at the same time, both on Bramall Lane, with one on the corner of Clough Road (BMW) and the other on the corner of John Street (Jensen). 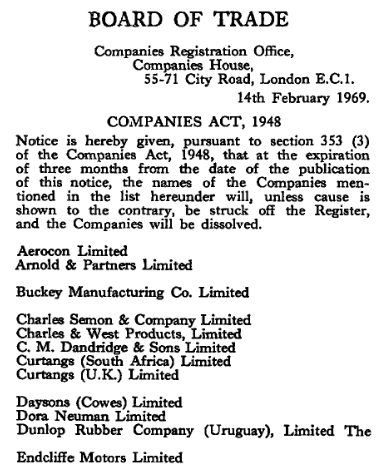 Maybe it was all one concern (and hence the single phone number), or maybe it was all bought out and renamed, before going out of business just 3 years later? On the map, the photo I have attached is the red circle, the previous one attached by Edmund is the blue circle. Also as an observation, the ‘works’ at the rear of the garage, backing on to Countess Road was called ‘Albion Works’, so maybe that’s where the original comment came from about someone who used to work there? Mind you, interesting as this all is, none of this is answering Silo’s question about anyone remembering his restoration project going up in flames in the seventies? WOW, thank you to all that have inputted so far. Although I haven't quite had my questions answered it gives me a fascinating picture of what it was like then at Endcliffe Motors. Dealing in high end cars would always be a risk because of the low volume. I loved the picture of 1965 with the Mercedes out front. My father purchased a 1966 250S that looked just like those in the photo. He got it from the UK in 1966 and with NZ import laws of the day he had to have a UK friend drive it around for 6 months before he could bring the car back to NZ . I will ask him where he got it from! We had that car for 20 years and it hardly missed a beat. I was charged with cleaning and polishing the car and it looked brand new when he finally sold it. My Interceptor had a rego SWA888L for reference and David did mention that he picked it up from Bramall Lane. I have messaged the 'DaveH' who had posted earlier about working at Endcliffe Motors. I am hoping he gets the message and can fill in the gaps. He must have been there at that time as that business fell over in 1975.